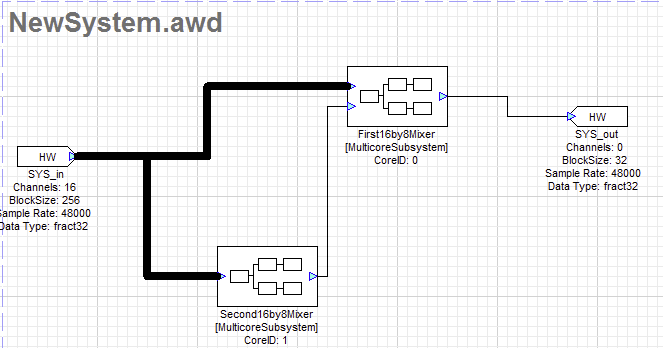 How to configure parallel multicore? I'd like to assign 16x8 to one core, another 16x8 to the other like parallel layout, 16x16 = 16x8 + 16x8. 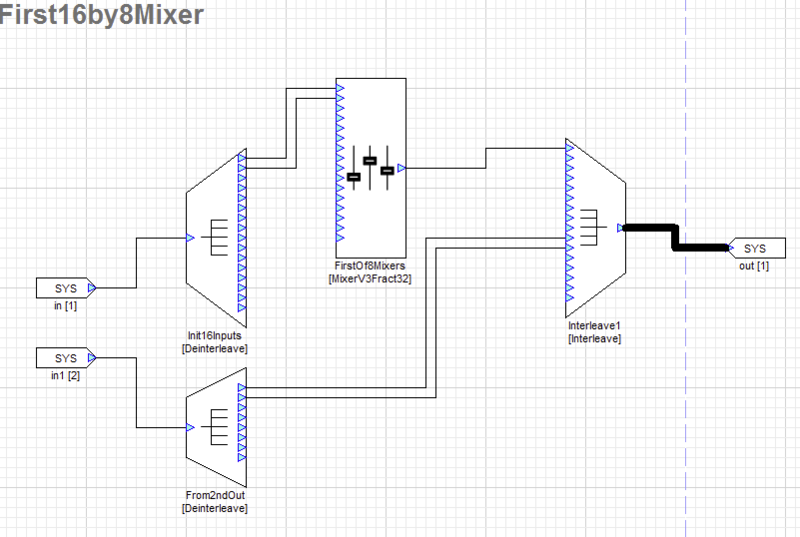 I only to found it's not allowed to put “Interleave” on the top layer to combine two 8 outputs from each subsystem. I remembered the initial AWE 6.x supports it but it's not. Would you let me know "how-to"? The input should go to both cores(as you have it drawn). 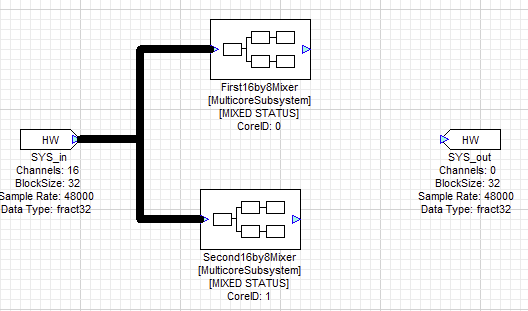 However, the interleaver has to go into one of the cores, so you should put a second input in your first subsystem and then you can route the output of the second subsystem into your new pin on Subsystem 1. Then you can put the interleaver in Subsystem 1. The output of Subsystem1 will be timely sync with that of Subsystem2 in front of interleaver in Subsystem1? It goes through Interleaver in Subsystem2 and Deinterleaver in Subsystem1 as the 2nd input. And does it result in the additional latency for transferring audio between two Subsystems like 5.33ms@256samples? 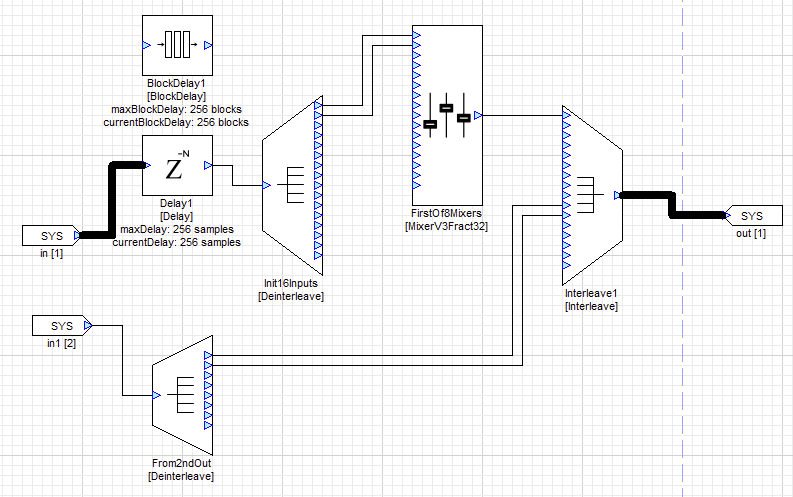 If so, the output of Subsystem2 will be later by 5.33ms than that of Subsystem1 just before Interleaver? Yes, you are correct in thinking that there will be latency. Thanks, If so, I should put some delay in the path of the first input in Subsystem1. Which do I use, Delay or BlockDelay? They seems similar. You should be able to use either delay as long as it is tuned to the correct value.